If you have never used Iron-on before, then you will find this Cricut Iron-on tutorial helpful. It's an easy process, but you still need resources to navigate it. Keep in mind that all these guidelines and tips apply to any brand of heat transfer. That means this tutorial will work for those that prefer to craft with Silhouette transfer material. Position the Iron-on material on your cutting mat, liner side down, and load the mat into machine. Select and size the images. Remember to mirror the images. If you do not, they will appear in reverse when transferred onto your fabric. Set your Cricut machine to Iron-on Material. Application is an important step when it comes to extending the life of heat transfer designs. Make sure you are following the full application instructions. It is important to pre-heat, heat, and post-heat your designs for the recommended amount of time. This will help the Iron-on material set into the fibers of the project fabric. Do not layer any Iron-on material over Glitter Iron-on. The material may seem to transfer just fine, but when washed, the material on top of the glitter layer will begin to peel away. However, Glitter Iron-on may be layered on top of Iron-on Lite. Wash fabric before applying Iron-on. Remove unwanted pieces from the Iron-on design using a weeder tool. Set your iron's heat between RAYON and WOOL with steam setting OFF. For 10 to 15 seconds, use iron to preheat* the fabric where you will be applying the heat transfer design. Position the Iron-on on your fabric (the backing should be facing you). Cover it with a lightweight press cloth. Press with the iron for 60 to 70 seconds, using light pressure when moving the iron and firm pressure when the iron is stationary. For 15 to 20 seconds, press the tip of the iron around the edges of the image to make a stronger bond. *Always use a press cloth (or a clean cotton cloth, such as a dish towel) over the top of your material when applying heat. This will protect your base material from the heat of the iron. Remove the negative Iron-on film, leaving only the desired cut image on the liner (this process is known as weeding), using the weeding tool. Use the iron to preheat* the area of the material in which you will be applying your cut image for 10-15 seconds. Place the weeded image liner side up onto the preheated material. Apply medium pressure with the iron for 25-30 seconds. To ensure best results, test a piece of Iron-on in an inconspicuous part of the fabric prior to application. Be sure you are applying Iron-on material to a clean fabric. It is usually a good idea to pre-wash fabric before application. Clothes are often treated with chemicals that make the colors look more vibrant on display in stores. These chemicals should be removed before applying Iron-on. Avoid using fabric softener when pre-washing materials. Drying the fabric will shrink it, which can be problematic if it isn't shrunk before the design is transferred. Using the Cotton/Linen setting of the iron provides the best results for most materials. 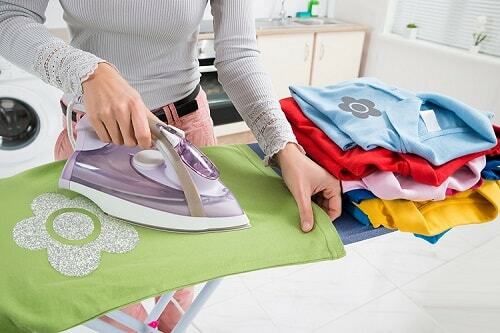 For steam irons, turn the steam setting OFF when applying Iron-on material. Iron-on is intended for use with all electronic die cutting machines. For a longer lasting design, wash and dry your finished product inside-out in cold water and do not use bleach. If there are areas of the Iron-on material that seem to be coming off after washing, simply re-iron the material in place. If you are looking for Cricut Iron-on, then you are in the right place. We have everything from regular Iron-on, to Iron-on Lite, to Glitter. If you found this Cricut Iron-on tutorial helpful, then please share it with your crafting friends in social media and on message boards. You will love shopping all our discount paper craft supplies.